As with every other white chocolate mud cake we have tasted, this cake has a fairly subtle white chocolate flavour. We like to make the cake a few days before serving as the flavour and texture of the cake improve with time. Although we store the cake in the fridge, we bring it to room temperature before serving; it is softer and more cake-like at room temperature. When experimenting with recipes, we found that some of the larger, higher cakes became very brown and dry on the outside before they were properly cooked in the middle. This recipe makes a cake that is about 5cm tall when iced. You could make two of these cakes and sandwich them together with ganache if you would like a finished cake that is quite tall. The white chocolate ganache contains sour cream to cut some of the sweetness of the white chocolate. Preheat oven to 160 degrees Celsius (145 degrees Celsius fan-forced). Grease a 20cm square cake pan and line the base and sides of the pan with baking paper. Place chocolate, butter, milk and sugar in a large saucepan over low heat, stirring frequently. Remove from heat when chocolate and butter have melted, and stir mixture until completely smooth. Allow mixture to cool at room temperature for 15 minutes. Stir flours together in a large bowl. Add one cup of chocolate mixture to the flour and stir until a smooth paste forms. Repeat with another cup of the chocolate mixture. Add remaining chocolate mixture and stir until mixture is smooth. This gradual method of combining the wet and dry ingredients helps prevent lumps. Bake for about 1 hour 10 minutes to 1 hour 20 minutes. When the cake is ready, a fine-bladed knife inserted into the centre of the cake should come out without any batter attached. Loosely cover cake with greaseproof paper or a clean tea towel and allow it to cool to room temperature in pan. The cooled cake can be iced with the white chocolate ganache immediately (see directions below), or stored and then iced on the day of serving. Store cake in an airtight container in the refrigerator and bring to room temperature before serving. The cake is suitable to freeze iced or uniced. 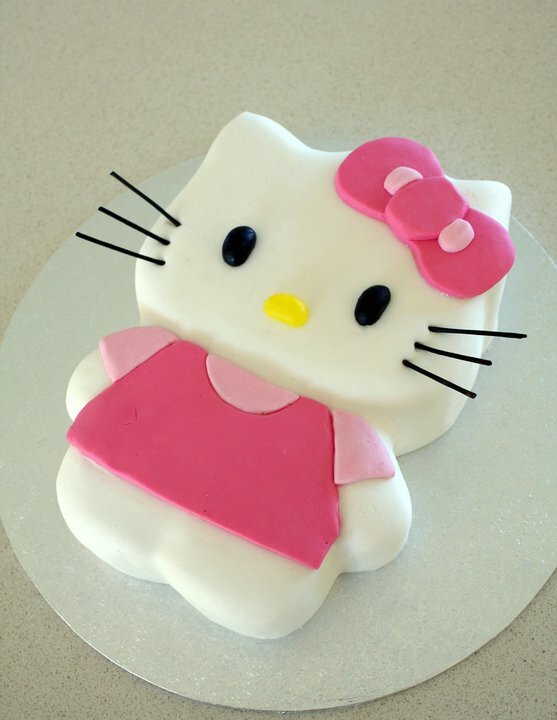 The following photos were submitted by Brendan, who made these owl and Hello Kitty birthday cakes for his girlfriend. The following photo was submitted by Beckie, who made this mud cake for her engagement party. A white chocolate mud cake and a chocolate mud cake were sandwiched together with a layer of chocolate ganache. The cake was then iced with white chocolate ganache. White chocolate panels were positioned around the outside, and the top was decorated with pink frangipanis. Chocolate Mud Cake (double the quantities specified in the recipe). White Chocolate Mud Cake (triple the quantities specified in the above recipe). Baking time and temperature: Both cakes were covered with baking paper and baked at 150 degrees Celsius (fan-forced) for about 1 hour and 45 minutes. The following photo was submitted by Neree, who made this cake for her daughter's birthday. The plain flour was replaced by the same quantity of Healtheries Simple Baking Mix. Each cup of self-raising flour was replaced by 1 cup Healtheries Simple Baking Mix plus 1 heaped teaspoon gluten-free baking powder. About 2 cups whole macadamia nuts were ground in a food processor, and the resulting macadamia meal was added to the cake mixture. Neree says, "Gluten free flours often result in a drier final product - the nuts help with moisture. Adding some of the dry ingredients to the nuts when processing helps stop them forming a paste." Neree cut the middle out of the smaller cake, spread the top of the larger cake with ganache, and then placed the smaller cake on top of the larger cake. The whole cake was then covered with melted white chocolate, which was allowed to set before the mermaid's pool was filled. Cooled, but not set, blueberry jelly (made with about 2/3 of the recommended amount of water) was poured into the cavity. The cake was decorated with seashell chocolates, coloured sugar, fruit jubes, candles and a mermaid doll. The following photo was submitted by Jolene, who made these cakes for her sister-in-law's wedding. The ivory-coloured fondant icing was attached to the cakes with sugar syrup. The seashell chocolates were fastened with melted white chocolate. The cutting cake was made from one batch of batter baked in a 6 inch (15.2cm) diameter round pan at 145 degrees Celsius (not fan-forced). One batch of batter was used for every 12 Texas muffin size cupcakes. The cupcakes were baked at 145 degrees Celsius (not fan-forced) for 35 minutes. Made this for a friends birthday - sooooo good. Was dry around the outside though - so I just cut it off - still great. I added peppermint essence to the ganache and decorated with cool mints. I used this recipe as a trial for my wedding cake. It is beautiful and will be definately using it when the wedding comes around! The cake didn't come out as I expected. I baked the cake for 1 hour and 25 minutes at 160 C. The taste of it was excellent but the texture was heavy and gluey. I don't know what was the problem as I followed all the instructions. Can anyone help me? Could you send us an email (amanda@exclusivelyfood.com.au) so we can try to figure out what the problem might be? I am going to use this recipe as the top cake for a wedding. The rest of the cake will be cupcakes. Will this recipe translate into cupcakes, and if not, do you know of a white cake which will. Yes, you can use this recipe to make cupcakes (we have done so here). does anyone know if this recipe is the same as one that appeared in a magazine(maybe family circle???). The cadbury dream choc rang a bell with me. Trying urgently to find recipe, made one last year and it was great. The WW white mud cake is SO oily ans I know I had a newer recipe that was good. Any ideas? This is an original recipe - it has not been published in any magazines. could you use normal cream for the ganache or do you have to use the sour cream? I first made thsis recipe last yr and everyone loved it. I made it wen my aunty came from England and she asked if I bought it because she thought it was so good. Made it for my friends and they ate it realli fast. Ive only made 6 of these cakes since finding the recipe and WOW. Regarding the white chocolate ganache: we have tested the recipe using cream instead of sour cream and it worked well. hi, i was just wondering, do i have to melt the chocolate for the ganache using a water bath? You are probably less likely to burn the chocolate if you use a water bath. However, we don't have any problems when we use direct heat. We place the chocolate in a heavy-based saucepan over the lowest possible setting on our electric cooktop. We stir the chocolate occasionally and remove it from the heat as soon as it has melted. We love this cake. I have made it countless times for family birthdays and keep being asked to make it over again and again. But using a silicone cake tin I find the cake cooks evenly and doesn't go dry on the outside. For the cake Beckie made, did she use triple quantities of the white mud recipe for a 30cm square tin? Have I read that right? Yes, Beckie did triple the quantities for the white chocolate mud cake and used a 30cm square cake pan. just wondering if the measurement for the flour is correct. I alway though 250gm was 1 cup, although the recipe states 150gm? One Australian cup holds 250ml. The weight of 1 cup of an ingredient will depend on how dense the ingredient is. Just as a bag full of rocks will not weigh the same as a bag full of feathers, 1 cup of flour does not weigh the same as 1 cup of coconut etc. When we fill a cup with flour, the weight of flour that fits into the cup is about 150g. can i use a round cake tin instead of a square cake tin? A round cake tin with a diameter of 22cm or 23cm would be suitable. I made a double batch of this recipe and cooked individual size cakes. Sensational recipe, will definately be adding to my repetoire. Looking forward to using it again. Thinking of using this cake for my daughters wedding. How long can this cake be stored before icing and can it be iced with plastic icing successfully? If iced with the plastic icing how long can it sit before the wedding and how should I store it? Could you send us an email so we can get a few more details and discuss a timeline with you? Hi, I have made both the mud cake recipes from your site both are great. I was wondering if you could make a marble cake using half of both mixtures?? Hi I'd love to make this for my wedding cake - can you tell me ingredient proportions for 6, 9 and 12 inch round cakes? Also, can you advise the best way to ice the cakes, preferably chocolate icing? Thanks. Hi Mich again, I did make the marble cake using half of each of the mud cake recipes. Baked for 1hr 20mins in an 18cm square pan and iced with the chocolate ganache and half of the white chocolate ganache...and it was fantastic. Thank you so much for your site. I am a frequent visitor. Hi, I am wanting to bake this cake for my sister's 21st and I am just wanting to know how I would go about making the marble mud cake as referred to by Mich. Thanks. Sorry we didn’t get back to you sooner. Thanks for sharing your idea and the results. We are glad the cake turned out well! How tall are your cake pans? If you would like your cakes to be about 5cm tall, then you will need 1/2 the above quantities for a 6 inch diameter pan, and the above quantities for a 9 inch diameter pan. For the 12 inch diameter pan, you will need slightly less than double the above quantities (we would double the above recipe and use a small amount of the batter to make some cupcakes). We aren’t sure what you would like to know regarding the icing of the cakes, so please send us an email with any questions. Mich used half of the above recipe and half of this mud cake recipe to make the marble mud cake. The only details we have are those provided above by Mich (we haven't made the marble cake ourselves). Hello, I am going to make this cake for a Birthday. If I make it on Wednesday afternoon will it be okay for Saturday? Am I best to store it in the fridge? Is it okay to ice it the day I make it (I just want to double check). It would be fine to bake and ice the cake a few days before serving. Once you have iced the cake, we recommend that you store it in the fridge. To serve 50 people, you could use a 28cm diameter pan for the bottom tier, and an 18cm or 20cm diameter pan for the top tier. If you could let us know which mud cake recipe you've decided on, and what size pans you'll be using, we can calculate the ingredient quantities that you will need. Generally, we prefer to bake cakes as close as possible to the day of serving. How many days will you require for icing/decorating? if i was making this cake for 50 people no layers just whole 5cm thick in a 13" square tin, will the recipe be fine to just double or do i have to triple it. Wooooweee, I made this cake for my little boy's first birthday party and everyone absolutey loved it. Such a gorgeous recipe. I will definately make it again. I, Hi enquired about doing the wedding cake for desert for 50 people. I will use the cake pans you suggested (20cm and 28cm round) and go with the white mud cake as I'm using white icing. I only need a day to decorate and will do this the day before. If you could let me know the quantities and baking information that would be fantastic. Thanks heaps. To make this cake in a 13 inch (33cm) square cake pan, we would multiply the ingredient quantities by 2.75. If you’d prefer to multiply by a whole number, you could multiply the quantities by three, and if you feel there is too much batter for the pan, use a small amount of it to make some cupcakes. Please send us an email if you would like us to calculate the quantities for you. Unfortunately, we can’t help with the exact baking times as we have only made this mud cake in a 20cm square pan. Because these cakes are for such a special occasion, we recommend that you make some test cakes to determine the correct baking times for your oven and ensure you are happy with the flavour and texture of the cake (if you haven’t used this recipe before). 1) Use the above quantities for the 20cm diameter pan. For the 28cm diameter pan, multiply the quantities by 1.5. The 20cm diameter cake will probably be slightly taller than the 28cm cake. If you would like both cakes to be the same height, you could trim the taller cake to match the shorter one. 2) Make one batch of batter as above. Reserve a small amount of the batter, and use the remaining batter to make the 20cm diameter cake. For the 28cm pan, multiply the above quantities by 1.5, and add the reserved batter to the pan. Hopefully, both cakes will then be the same height. 3) Multiply the above quantities by 2.5. Divide the batter between the pans so that the batter height is the same in both pans. If you need help with multiplying the quantities, please send us an email. Would be good to print out the recipe with pictures - not print only words - the font is miniscule very difficult to read when following recipe. I made this cake and it was great. My only query is; is there a way to make it taste chocolatier? I would like to use this recipe for my grandparents 50th wedding anniversary cake. I was just wondering how many it serves? Thank you very much for bringing the miniscule font problem to our attention. We have found the cause of a printing problem that occurs when using Internet Explorer 7. It should be fixed by the end of the week. If the tiny font problem occurred when you were using a browser other than IE7, please let us know. We are also working on creating printer-friendly pages that will include the recipe photos but not the ads or sidebar. Unfortunately, we don't know of a way to make this cake taste more like white chocolate. Unlike milk chocolate and dark chocolate, white chocolate doesn't contain flavoursome cocoa solids. When making a cake with milk/dark chocolate, cocoa powder can be added to boost the chocolate flavour of the cake. However, adding cocoa powder to a white chocolate mud cake would basically turn it into a milk chocolate mud cake. We find that this cake serves about 20 as a dessert or about 40 if served in small slices after dessert. I was looking for a white chocolate mud cake recipe at the last minute for my husband's birthday and once again your site came through with the goods. I was amazed at how easy it was to make. I made it on the day of the party and served that night. It went down a treat. I had to make it in a loaf tin (as it was the only one I had) and it was great for easy serving. Topped with raspberries everyone loved it. Also had to use lindt white chocolate (no cadbury white chocolate here). I was concerned it wouldn't melt as good but it worked ok. Thanks for the great recipe! Just wondering whether the ganache quantity is enough to cover the top as well as sides? Just wondering how many cupcakes this cake batter would make? I'm making a 14 inch square mud cake. What quantity of cake mixture do I need and how long do I need to cook it for? I was planning on making two 14 inch square cakes (one choc mud and one white mud) for a wedding. Will there enough to serve 120 people for dessert? Yes, there should be enough ganache to cover the top and sides of the cake. We would multiply the above recipe by either 3 (the cake will be slightly shorter than the one above) or 3.5 (the cake will be slightly taller than the one above). Unfortunately, we can’t help with the baking time as we have only made this cake in a 20cm square pan. Yes, two 14 inch square mud cakes should be enough to serve 120 as a dessert. This was the best cake I have ever made to date ! I made 12 cupcakes and a small cake from it and all of it worked out superb. Everybody raved ! I took a shortcut in melting the first step of ingredients in the microwave, and it worked out fine. Thanks heaps for publishing it ! Could I throw some macadania nuts into this recipe without sabotaging it?? Also, how do i make the chocolate panels for the outside. I know you simply melt the chocolate and put it on a tray but what is the best way to cut them without breaking the chocolate into little pieces? Hi, I would like to use this recipe to make a 3 tier cake using all the same size tins, 25cm square. Would 3 tiers be too heavy to sit on top of each other without sagging? This recipe will make about 25 cupcakes if using a pan with 1/3 cup capacity holes. Please see our comment here for more information. I made this cake for mothers day. I made it on thursday night and we had it on sunday afternoon. It was beautiful! I iced it with plastic icing on thursday night when I made and this kept it very moist. I also added a twist. I made some caramel and twirled it into the cake with a spoon just before putting the cake in the oven. This made it into a white chocolate and caramel marble cake. It was AMAZING! I will definitely be making this cake again! We recommend that you use supports to prevent the cake from sagging. This website has step-by-step instructions. To the person who asked about adding macadamias to the cake: We don't think that macadamias would have a negative effect on the cake. For instructions on making chocolate panels, see this web page. I have made this cake twice now, and love it! I recommend it to anyone after a white choc recipe, and have your website linked to my blog! Thanks for the fantatsic inspiration, it's revitalised my love of cooking - carrot cupcakes are on my list for tomorrow now! My cake was also dry on the top and edges which I cut off but it is an uneven colour, doesn't look at all like the picture. What have I done wrong? I would like to make a top deck type birthday cake by using the choc mud as the bottom layer and the white choc cake as the top. I noticed the recipe for each uses a different shape/size tin. How do I adjust the white choc recipe to end up with two layers of the same thickness? I want a not too tall cake and this one fits perfectly. But I'll be baking this in a 20cm round cake pan (that's likebout 7.8 inch). Will the cake batter be just nice for my pan? Also, I would like to bake 2 thin cake with this recipe rather than having to bother to slice the cake in half once it's done (I always create a mess when I do this!). In the end, do you suggest I bake this cake in my round 20cm pan and bake this twice, each with half the batter and also HALF THE TIME? please kindly advise asap. thanks a bunch! Could you describe the uneven colour a bit more? Were the ingredients thoroughly combined? Did the cake taste okay? i'd like to make this cake for my cake decoration course in couple of weeks to learn covering a cake with fondant. do you think it will carry the fondant? and please advice me if i need to do anything different then the original recipe. If you use the above quantities and a 23cm round pan, the cake won't be as tall as the chocolate mud cake. However, you could trim the chocolate mud cake to match the white chocolate mud cake. You could multiply the white chocolate mud cake recipe by 1.5, but you might have a little too much batter. If so, you could use a small amount of the batter to make some cupcakes. I am making this recipe as cupcakes for my daughter's wedding party. Some of our family are gluten intolerant and as I've never cooked with gluten free flour before I was wondering if anyone would know, either Amanda and Debbie or their loyal readers if using gluten free flour will make a difference to the finished cake? This site is excellent btw! The amount of batter would be suitable for a 20cm diameter round pan. You could halve the batter and bake two thin cakes. The half-size cakes will probably need to be baked for more than half the original baking time. Unfortunately, we can't recommend a baking time as we have only baked the cake in a 20cm square pan. We use fresh (liquid) cow's milk that contains less than four percent fat. Reconstituted powdered milk should also be suitable for use in this recipe. The cake is supposed to be quite moist. What was the texture like once the cake had cooled? This cake should be suitable to cover with fondant. We don't think you would need to make any changes to the recipe. Hi there - I'm also wanting to bake the cake for my daughters birthday using Gluten Free (GF)Flour. I haven't tried this cake yet but it looks great. I often use conventional recipes and adapt them to GF by using Healtheries Simple GF Baking Mix (available from most NZ supermarkets - not sure about Oz). In most cases the mixture is runnier than normal (the gluten gives elasticity - GF flour doesn't have this). You can add a Gltuen Substitite like Xanthum or Guar Gum but you need to be very careful as you may end up with a very rubbery result. However, I've found the best method of bulking up is to add about a cup of freshly ground almonds (adds a great flavour and texture too) - you could also use brazil or macadamia nuts with white chocolate. I grind the almonds in a coffee grinder but find that Brazils and Macadamias contain more oil and tend to form a paste so best to use the food processor for these. Would appreciate feedback from anyone who has made this cake GF. My duaghter is having a Mermaid Sea Party for her birthday so my grand plan is to make two round cakes, cut the middle out of one and sandwich them together with ganache - top with either ganache or melted white chocolate and fill the centre hollow with jelly (to look like water). Add yellow coloured sugar for sand, some icing or lolly shells and a mermaid doll to finish. Hopefully it'll all work out!! I have used fondant on this cake and it turned out great. I prepared the cake about 4 days in advance and it was very moist! Can i swirl in Caramel with the cake batter before placing it in the oven or will it affet the setting of the cake negatively? Thanks Neree for your advice on making cakes with GF flour. I think I might stick to the original recipe for this mudcake as I will have other GF desserts, I got a GF cake mix to make the cake for the trifle I am making. I added some caramel to the batter before putting the cake in the oven and it turned out magnificient. It was a white chocolate and caramel swirl cake. It was beautiful! To make the cake moister and denser, we recommend reducing the amount of self-raising flour from 100g (2/3 cup) to 38g (1/4 cup). I made this cake for my mothers birthday. very easy recipe to follow. HELP! I just made this cake as a trial for my sister-in-law's wedding cake..doubled the mixture for a 25cm round tin and cooked on 150 degrees ff for nearly 2 hours....it tasted great - but was not cooked through and was heavy and undercooked (not formed well). What have I done? I'd love to use this recipe for a birthday cake I am making. But I have a couple of questions?? Also, do you think it would be ok to stir some well-drained, crushed blueberries through the mix prior to cooking? Thanks for the wonderful recipe. I used brown sugar instead of caster and got the best caramel mud cake. Did you test the cake with a knife or wooden skewer before removing it from the oven? For a 300mm square pan, we would multiply the above quantities by 2.25, so you could multiply the quantities by 3.25 for the two cakes. Even if well drained, the blueberries might release moisture and make the cake too wet. If you try adding blueberries, please let us know how the cake turns out. hey i was wondering if you can put this into a rectangled cake tin i know this might sound like a silly question mut i keep seeing a round tin and square tin but no rectangle tin...... also what do u put inbetween the cakes to get them to stay together?? Do you have a Caramel Mud Cake recipe? Also, If I wanted to cut them into layers and make a genache with nuts what would you recommend? Finally I want to make them in advance. How do I go about freezing & thawing them before I cover them in fondant? And should I freeze them before or after i make the genache in between? Yes, you could bake this cake in a rectangular pan. We're not sure what the second part of your question means. Could you explain what you would like to do with the cake? Hi, I would love to make this cake in the Wilton Giant Cupcake Tin, which measures 15.5 x 8.25 x 3.75 inches (10 cup capacity). What quantities of the recipe would I need to make & any idea about baking time? Thanks. Are the cake tins round or square? Just made this cake with dark chocolate ganache (also from this site), which really went well with the white chocolate! I made it 4 nights in advance, and was still quite good! With that being said, ill probably just stick to the chocolate mudcake next time.. I'm a cake decorator, and this is a bit diffenent to my recipe, I'm going to try it.. I add alcohol to my cakes as well for more flavour and keeping purposes.... rum/kaluha what ever you fancy. The tins will be all square. 30cm White Chocolate Mud Cake: Multiply the above recipe by 2 1/4. 21.8cm square Chocolate Mud Cake: Use the recipe as is. 15cm Marbled Cake (White and Chocolate Mud): One quarter of the above recipe and one quarter of the chocolate mud cake recipe. 10cm White Chocolate Mud Cake: One quarter of the above recipe. We don't have a caramel mud cake recipe, but one of the above commenters has made a caramel version of the white chocolate mud cake by using brown sugar instead of white sugar. Are you looking for a nut suggestion? We don't have much experience with freezing cakes, but we suggest the following: Tightly wrap the unfilled cakes in a few layers of plastic wrap before freezing. Thaw in the refrigerator. Thank you soo much for your assistance! Oh and yes any nutty suggestion would be great! Hi... I'm making a cake for my 18th birthday and i think this recipe looks good. Could you tell me what quantities to use for a 7 inch/18cm diameter, 2 1/2 inch/7cm deep round cake tin and a 9 inch/23cm diameter, 2 1/2 inch/7cm deep round cake tin. Please. Hi Girls; Love your site and such fabulous recipes and blogs. This WC Mud Cake sounds divine and so many positive responses. I intend to make it for my daughters wedding and it will be served as the desert Sorry to have to ask the same old question, but I am confused as to the quantity of recipe for size/ shape of tin. To those who have asked about the ingredient quantities for different pan sizes (Alex, Cab and Anonymous): Under the above recipe, we have added a link to a table that lists the ingredient quantities for various pan sizes. Anonymous, we aren't sure how many cups of batter the above recipe makes but will determine this next time we make the cake. Decorated with Chocolate Roses, Large Curls and Choc coated Strawberries. Will email pic - looks good hope it tastes as good as it looks. I'm about to make this glorious cake for a friend's 40th birthday party. I'm always nervous about making something untested for a large group, but the comments have all been so positive. A question about quantities - I'm using a 30cm square pan. According to the PDF file I should use 675 grams white choc etc. But in the comment from Beckie (the lady who made it for her engagement), she tripled the recipe for the same size pan (i.e. 900 grams white choc). Any suggestions? We think that roasted macadamia nuts, almonds or hazelnuts would work well. Beckie tripled the recipe quantities to produce a taller cake. 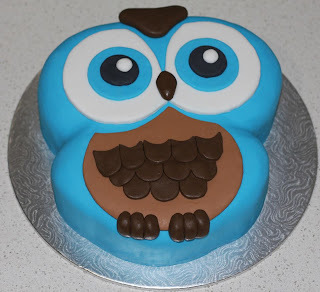 I'm making this cake for my brother's 30th, can you please tell me the measurements to make in a 9 x 13 inch cake tin? I made this cake today for my sister's birthday and it was BEAUTIFUL!! I'm quite useless when it comes to baking, measuring etc (lol), but this recipe was easy to follow and pretty foolproof. Everyone was generally shocked that I'd made it 'cos it was so delicious and moist and thought it was bought!! Hi, i'm thinking of using this recipe for my engagement cake. I need approx 200 people to have a slice, what size tin do you think i will need and should i tripple the recipe?? Also how long before can i make it, and ice it?? I made this cake using a 30cm pan and used the quantities from your PDF file (thank you - a great idea). I ran out of time and made the cake the night before the party. It was good, but not fabulous ... but two days later, eating the left overs and OH MY GOD!!! Totally delicious. Definitely make the cake a couple of days before eating. Ganache turned out yellow which was a bit of a surprise, but again, yummo. Could you use food dye to colour the icing, and then pipe onto the cake? I am making this cake as a "shaped" cake. The design is to be baked in two pyrex bowls. Do you anticipate any problem with this. Do I need to make any adjustments to the recipe? Made it for a friend who adores white chocolate so this was a hit! everyone else at the birthday celeb enjoyed it too... tremendously dense.. yumz.. I am currently making this cake and i sound that a mashmellowy icing using egg whites and melted sugar and water works amazingly with white chocolate mud cakes! For a 9 inch by 13 inch cake pan, we recommend using the quantities specified for a 28cm square pan. To the person who asked about the engagement cake to serve 200: Will you be serving the cake as a dessert or in small pieces with coffee? Hey there, brilliant recipe. I have just made it using the dark and white chocolate into a marble mixture, but as a jaffa cake. I placed 2 teaspoons of gran marnier and orange essence into the dark cake, as well as an extra tablespoon of cocoa and zest of half an orange, and in the white mud cake placed three teaspoons of granmarnier, 3 teaspoons of orange essence and zest of one half orange. The result is absolutely magnificant flavour, pulled it out of the oven an hour ago. Food dye could be used to colour the ganache. The consistency of the ganache may be noticeably altered if a large amount of food dye is used. The ganache can be piped if allowed to thicken to a suitable consistency before using. We don't think there would be any problem with baking the batter in Pyrex bowls. Apart from adjusting the baking time, you shouldn't need to make any changes to the recipe. Thanks for the great recipes. I am experimenting - I am making my friend's engagement cake for 60 people with a 10"/8"/6" (choc mud base, top undecided). Yesterday I made the white choc 8" and put in fridge. Today I got it out to ice it and it's flat as a pancake and rock solid. The choc mud cake is perfect, so I don't know what I did wrong. Any tips? I need to perfect the recipe by the end of the month! I used the amounts in the pdf and cooked it for 1hour 15mins at 145deg fan-forced. Is it possible that you used plain flour instead of the self-raising flour? Did the cake seem properly cooked (not overcooked or undercooked)? Did the cake taste okay? Do you have to add the wet to the dry or can you add the dry slowly to the wet? Do you have to use Castor sugar could you use normal white sugar? Regular white sugar could be used instead of caster sugar. Hi. I am a frequent visitor to this site and I love the gorgeous recipes and fantastic helps. Tho I like to print selected recipes from this site, I have noticed one thing changing which isn't the best anymore. Before I was able to cut and paste information from here. And the bonus of being able to do so earlier was that I could 'pick and choose' from the comments added to the recipe I was printing. Some of the comments on recipes are very useful. And now I cannot do that anymore and am forced to print 'ALL' pictures with the recipe or ZILCH pictures and only recipe. I hope there may be a change back to the old 'cut n paste' function soon which allows for more flexibility(?). How long would this cake keep in the fridge either iced or uniced. I made this cake for my son's Christening and it was the best cake I have ever made! I did 1.5 times the recipe and made it in a larger round tin and it cooked to perfection. I made a different ganache with white choc, cream and butter which was also nice. I would definitely recommend this for a sepcial occasion cake. You could add the dry ingredients to the wet ingredients if you prefer. To the person who asked about the tin size: We have stated the top inside measurement of our pan in the recipe. The pan you have will be fine to use. We recommend positioning the cake such that the centre of the cake is in the centre of the oven. To the person who asked about the keeping time: We have never stored the cake in the refrigerator for longer than a week. I will be using this cake for the top-tier of my Cupcake stand. I am using a tin that has a 6inch diameter and is 3 and a half inches tall and I would like the finished product to be this height. How should modify this recipe? We suggest that you use the ingredient quantities specified in the above recipe (you may have a small amount of excess batter). When you line the cake pan, extend the baking paper at least 5cm above the top of the pan to prevent the batter overflowing in the oven. The text and photos on this website are copyright protected. Some people don't realise that this means they shouldn't copy and paste the recipes onto other websites. We have therefore made the text unselectable to discourage this practice. We will try to think of solution that would allow you to print the comments. Thanks for the reply. - I am looking forward to any upcoming solutions. Hopefully it will allow a person to select some comments as opposed to having to print them all. Thanks for your inspiring recipes on here. I made this chocolate mudcake as per recipe at work and it was a success - people loved it. I love your recipes. I was wanting to add macadamia nuts to this recipe how and when should I add them? Will it affect the cooking time? I made this cake a week ago and baked it at 160 C for 50 minutes (it was golden brown and no crumbs were attached to the skewer). It didn't really work out as the texture was too dense and not very moist. Do you think this is because of baking it for less time (I would think baking it longer would've dried it out further), or could you suggest another reason why the texture was so dense and dry? I would like to work it out to try it again as the taste was good, but ruined by the texture. Thanks! Howdy! I'm Joy and i was just wondering if anyone can advise me how to cook this cake. My oven is hotter than most others, non-fanforced and is regrettably prone to burning the tops of things, leaving the bottom uncooked... Any suggestions?? We suggest that you add the macadamia nuts to the bowl with the flour. The baking time may need to be slightly altered (test with a knife or wooden skewer to determine whether the cake is cooked through). Did you use a square cake pan with a side length of 20cm? If so, it sounds like your oven is hotter than ours. We suggest you reduce the oven temperature so that the required baking time is closer to 1 hour and 15 minutes. The cake should be dense but not dry. Did you find that it became moister over time? Also, did you use scales or cups to measure the ingredients? Thanks for your reply. I used a 23cm round tin, and measured the ingredients in cups (Australian cups). I stored the cake in an air tight container in the fridge and found it got dryer over time rather than more moist. The problem could be with my oven - it does tend to cook things quickly, just not usually as quickly as this! I made this cake the other day and wow, it was so so good! I think my baking pan was a bit smaller so the cake was taller, and i should have left it in the oven for a bit longer because it was not completely cooked through in the middle, but this really did not affect the cake at all. It was delicious! And the icing really complements the cake well! Everyone loved it! I need the quantities to make 30 cupcakes please (4 a wedding). This was one of the most fabulous cakes I have ever baked! I made it for my cousins 18th birthday party and everyone was raving about it thank you so much everyone was asking for the recipe! Could you please let me know how much baking powder I would add to this recipe if I only have plain flour? Trying to make it tonight. However, would really appreciate knowing the quantities for a 20cm square tin please. Also the approx baking time. Have you tried baking cakes on the lowest shelf in your oven? If the cake is not cooked through but the top begins to overbrown, you could cover the cake with aluminium foil or greaseproof paper for the remainder of the baking time. We have information on using this recipe to make cupcakes here. If you need more help determining the ingredient quantities that you'll need, could you please let us know the capacity or dimensions of the cupcake cases? To the person who asked about using baking powder: If your baking powder package doesn't have any instructions for making self-raising flour, you could use 100g (2/3 cup) plain flour and 1 1/3 teaspoons baking powder to replace the self-raising flour in this recipe. Making the cupcakes today for my 1yr old - will let you know how they turn out. Still my favourite and most recommended cake recipe. To the person who asked about covering this cake with ganache, rolled chocolate, and then fondant: We think it would be fine to do so. The above cake is made in a 20cm square pan. If you are looking for ingredient quantities for chocolate mud cakes of various sizes, please see the Ingredient Quantities for Various Pan Sizes link on our chocolate mud cake page. Hi there, we're making a chocolate mud cake with this recipe's white ganache, for a friend's wedding. only problem is, the ganache didn't turn out white, more like a yellowy cream! does anyone have any suggestions on how we can whiten up our ganache for the real wedding cake? And I decorated it at my daughter's request with raspberry white chocolate bullets! Hello, I was wondering if I could use white chocolate bits melted if I didn't have enough cooking white chocolate? Hi, i am thinking of using this recipe for my son's second birthday cake. the only thing is that he wants a train cake which i have gotten the recipe from the WW kids cake book. The tins that i will be using are four 8cm 26cm bar pans. Can you please tell me as annoying as my question might be, do i need to alter the recipe and any suggestions if i do or should i just play with quantities and see what happens. Is the ganache ok to colour with food colouring? Thanks, Marianne. I was looking at the pictures you have provided and this may sound ridiculous but how do you get the baking paper to line the baking dish so well? could you a baking paper lines different baking dishes tutorial? Our white chocolate ganache is a yellowish cream colour. We haven't tried it, but using some white food colouring (icing whitener) in the ganache might help. I am normally the main chef of our household but when my birthday comes around I "allow" my partner to make me a cake. I picked out this recipe for him - it turned out devine! Everyone raved about it. So buttery, moist and delicious. I am going to marble it this week with milk chocolate mud cake. Can't wait for the results. Hands down, the best white chocolate mud cake recipe I have ever tasted! Thanks! To the person who asked about using white chocolate bits: Yes, white chocolate bits could be melted and used in this cake. For four 8cm wide, 26cm long bar pans, we would use the quantities specified for a 30cm square on the White Chocolate Mud Cake Ingredient Quantities for Various Pan Sizes table. Please see our above comment dated 30/10/08 regarding colouring the ganache. To the person who commented on lining the cake pan: We hope to add a 'how to line baking pans' article to the site in the near future. hi, i've got one small question before i try this cake. I will use a round 18cm springform pan. Do i need to halve / quarter the recipe?? I ask because my household only has two people, & you write that it serves 16!!! Hi... does anyone have or know where i could get a good (tasty) fondant icing recipe? This has become the recipe that I use when customers order WCMC (cupcakes) and I love it!!! I baked the cake according to instructions but it came out very flat and heavy, and had an extremely dense texture. Advice would be appreciated! To the person who asked about using an 18cm diameter round pan: For that pan size, we would multiply the ingredient quantities by 3/4. Please see our White Chocolate Mud Cake Ingredient Quantities for Various Pan Sizes table (the link is under the recipe) for more information. If you wish to make a small amount of cake, another idea would be to make a small batch of white chocolate mud cupcakes. Hi, I am thinking of using this as my wedding cake, I was just wondering how long it can be preserved for or what can i add into the recipe to preserve it so i can feeze it successfully to have on my first wedding anniversary. Also how long before the wedding should i bake it etc. I made the white chocolate mud cake and chocolate mud cake recipes from your site and they turned out fantastic.I made these into cupcakes for a party.What a hit. Thankyou!! Just wanted to let you know how well the cake turned out and what a favourite it has become with friends and family. It is so easy to make and has been made many times. It has been a birthday cake (iced plain) and an easter cake (decorated with small solid eggs on the top and the egg wrappers laid out flat and stuck to the sides of the cake). It was even made for a work morning tea and I spent the rest of the day sending people to your site for the recipe as it was such a hit! Hi I have made this cake before and it is amazing so I am planning to make this for my engagment cake but as I will need more servings I am planning to make a two tier sqaure cake with 30cm (12") and 20cm (8") tiers. Has anyone baked a 30cm square cake using this recipe as to know the baking time would be great? Also does anyone know if it would it effect the baking of the cakes if they were baked together on the top oven rack? Thanks! Just trying this receipe for the first time. Substitute vanilla essence for the scrapings out of a natural vanilla pod. I've also shared the mixture between 2 cake tins so I can sandwich them. Thanks ever so much for sharing such a quick, easy and simple to follow receipe. If this works out, I'll be using it for my Christmas cake. Have used many of your recipes and love your site, thx. I am wondering if I can add coconut to this recipe and, if so, how much you would recommend adding? I have been looking at other wcmc recipes and I notice that many have sour cream in them - is this just to add moisture to it? Could I put some in this recipe to make it heavier? hi made this in the form of cupcakes before and its absolutely devine. now i am considering making a 29x19cm rectangular cake and i was wondering how i need to adjust to get the a cake that is 5cm tall? also how much ganache would i need if i was not icing the sides of this cake? one last question: how much ganache would i need for a 20cm square cake if i was not icing the sides? Hello - I am planning on using this cake recipe next week for a baby bottle cake. I plan on baking 4 six inch rounds and then torting/filling/stacking them on top of each other before carving (very minimal carving since it will already be very much in the bottle shape). My doweling techniques are very sturdy, but my concern is the weight of this cake? Do you recommend not using it for tall heights?? Thank you in advance! Hello again - I went ahead and used the cake as is for the bottle cake I described above. It came out perfect and am still getting compliments on it. This will definitely be my go-to recipe for sure!!! I've just made this cake as a practise run for my birthday and it is delicious! I somehow managed to add only half the butter in the recipe, but it still tastes wonderful. It is less moist - somewhere between a mud cake and a sponge. Also, to get a chocolati-er taste you could try using a richer chocolate. I've noticed that if you use european style chocolates (such as Whittakers or something from Aldi) you always get a richer flavour in whatever your cooking. I used the ingredients for the 19cm round cake tin and it took just over one hour to cook. I was just wondering if this cake is ok to leave at room temperature a coupld of days before serving rather than in a fridge? I made this for the family easter dinner and everyone loved it. the icing was a nice suprise, I'd never think of using sour cream. there was a little left over which I saved for the next day, and the cake tasted even better! it was softer than it was, and still moist and delicious. Just wondering how I would go about adding food coloring the the recipe? Just made this with dark choc instead of white, so easy. Great texture and absolutely delicious. Thank you! It was a definate hit with the whole family.. Thanks guys, keep up the great work ! Made this cake as a trail wedding cake for my husbands birthday and now everyone wants one. As I will need to make about 10 days before the wedding so icing will dry enough to decorate with flowers I did the same with the birthday cake version and kept it in the fridge and it kept fine for this amount of time. I made this cake for my neices 1st birthday and christening. It was a big party so I used the variation table to make a bigger batch have to say it was fantastic and ALL of the cake got eaten, that's a first. I have tried so many recipes from here and the family love them all thanks girls. everyone LOVED it! the birthday girl had 2 slices.. I was just wondering what it meant by covering it with baking paper. is it supposed to be alfoil because i don't know how baking paper would stay on. Baking time and temperature: Both cakes were 'covered with baking paper' and baked at 150 degrees Celsius (fan-forced) for about 1 hour and 45 minutes. Hi, I love the recipe and made 3 cakes all in one week. The first did not rise as I expected and was a little doughey, I baked 11/2 lots of mix for the 2nd cake, it baked okay but had a very sugary top, the third cake did not rise at all and was very doughey. Mt oven is fan assisted but cooks quite slow, is it worth me splitting the mix between two baking tins, any suggestions. Made this cake and it taste so GOOD but, just wanna ask if i can use chocolate ganache to icing this cake? and do you have any ganache recipes? PLEASE!!! Thanks in advance. I made this for my wedding cake (3 tiers) I found it easy to make, I froze it for 2 days so I could ice it close to the day and not have the ganache frozen for too long. Best served at room temp, as cold it is a little thick and the flavour is less. I died the ganache icing with proper red die paste and it worked out beautifully. With 60 guests... we were lucky to save the top tier from being consumed as everyone kept going back for more. A 12.5" square cake slab formed the bottom tier, for that I x3 and it was plenty. I had over 5kgs of white chocolate in the house in the week before my wedding lol. I now have to keep baking the cake as friends and family keep asking for it. In the 6 months since my wedding i have made this cake another 8 times :D. A must have recipe. I've made this cake 4 times already this year! For my sons 8th birthday i added broken pieces of violet crumble then coloured portions of the cake. He loved his Rainbow White chocolate violet cruble cake! It must have been very nice, there was none left over for me! i made it again for my birthday. This time I made a sandwich two tiered cake. The top was chocolate mud cake sandwiched by white mud cake and the bottom was raspberry mud cake and white chocolate mud cake! Delicious!!! Now I'm just looking for an excuse to make another cake! Cooked this with dark brown sugar and got caramel mudcake, really yummy! Cooked in 30cm round pan in a fan-forced oven at 145 degrees for 1 hour and 45 minutes. It looked fantastic initially at about 1 hour and 20 minutes but was cooked for too long and went crusty. It went down too and I could not use it but it was my test cake and I will redo it at a lower temp and for less time. I'll keep you posted! Note: it is in the freezer and will be slowly devoured! Hi I wanted to make this cake for my son's chistening. I am using a 9" square tin. I want to add some finely grated orange peel and some juice to the cake mix to give it a subtle citrus flavour. I will be using an orange conserve to attach White Chocolate fondant. His christening is on a Saturday and I was thinking of baking the cake on the Thursday morning and icing it in the afternoon. Can you please comment on quantities and whether baking this far in advance is ok considering I won't be able to refrigerate it. It will be 30-33C from Thurs to Sat. Hi, my birthday is coming up and I have my heart set on making a white chocolate and raspberry mud cake. I've had a look on the internet and can't seem to find any suitable recipes. Do you think it would be as simple as throwing in some raspberries into the mixture before sticking it in the oven? We have been emailed by someone who tried adding raspberries to the batter. They found that the berries all rose to the top of the cake during baking and made the top section of the cake too moist. awesome cake extremely easy to make! my ganache went thick so just reheated slightly ...I put shards of white chocolate on the sides and made a plaque using milk chocolate melted and shaped into a disc and cooled then piped a birthday message in butter icing.....looked amazing! I have made this cake about a half dozen times now, and just keeps getting better and better! The texture and density of the cake is just perfect and I am yet to find a milk chocolate mud cake with the same consistency. Can I just replace the white chocolate in this recipe with dark or milk chocoalte instead? Will this affect the cake at all? Thank you! I'm planning to make this for my brother's wedding and i'm wondering how far in advance would I be able to bake this cake? Will I be able freeze it at all? If so, for how long? Also, when I want to ganache the cake, I'm guessing I should let it defrost properly first and then ganache it? How would you tackle this situation? Any tips?